Theresa May wants to work with the Labour leader on a plan, which MPs will vote on, while keeping her withdrawal agreement as part of the deal. That's all from Tuesday's Business Live Page. Many thanks for staying with us. Please join us again from 06:00 on Wednesday for all the news, views and analysis in the business world. Virgin Atlantic's flying lady emblem has been a key identifier of its aircraft for 35 years, but earlier on Tuesday it tweeted that it is to introduce a whole raft of new male and female icons "representing modern Britain". The airline says it will be the first to have male figureheads on its planes. Nikki Humphrey, senior vice president of people at Virgin Atlantic, said: "The saying goes 'you can't be what you can't see' and that has never been truer than the aviation industry's glamorous image in the past. "We have been working for a number of years to tackle our gender pay gap, create an inclusive workplace and increase the diversity of our workforce, through the development of our springboard scheme for women, as well as the launch of engineering apprenticeships. The Dow Jones fell for the first time in four trading sessions as investors paused after Monday's strong rise. At the close, the Dow was down 0.3% at 26,179.1 points. The S&P 500 was flat at 2,867.2, and the Nasdaq added 0.25% to 7,848.6. Energy and consumer staples were the worst performing shares. The real estate sector outperformed, rising 0.9%. Culture committee chairman Damian Collins has described tech firms' lack of action on privacy as "unacceptable". He also accused companies of shifting "superficially" but only "for the benefit of their own PR". Mr Collins is to lead a sub-committee of MPs to probe "threats posed by disinformation to democracies". Facebook founder Mark Zuckerberg has said he wants his company to become "privacy-focused". An 18-month long inquiry into fake news by the culture committee found that Facebook founder Mark Zuckerberg failed to show "leadership and personal responsibility" over fake news. The government has not spoken to French ports and has used satellite imagery to make "untested" assumptions for its no-deal Brexit plans for Portsmouth. A Department for Transport document from January, seen by BBC Newsnight, said: "We have not engaged with French port operators or the ferry companies". Earlier this year, the government was forced to axe its no-deal contract with a ferry-less shipping company. The Department for Transport said it does not comment on leaked documents. The manufacturers' organisation Make UK is the latest business group to comment on Theresa May's Brexit statement. Says Stephen Phipson, the organisation's chief executive: “The biggest risk facing UK manufacturers today is that we crash out of the EU without a deal. "We have consistently said this would be catastrophic for the close to three million people who work in our sector who produce almost half of all UK exports. "As a result we cautiously welcome the Prime Minister’s decision to seek a parliamentary consensus to resolve the deadlock. However, short term extensions simply add to business uncertainty and extend the economic pain many of our members are already experiencing. The CBI's director general has also reacted following Theresa May's announcement that she will ask the EU for a Brexit extension. Brexit: Still heading for a cliff? Reaction has been coming in from business in response to the PM's announcement that she will look to extend the Brexit deadline. Dr Adam Marshall, Director General of the British Chambers of Commerce, said avoiding a "messy and disorderly" exit from the EU was still the top priority for business. "On-going uncertainty is having a real and negative impact on business confidence and investment all across the UK. 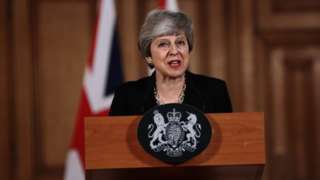 Our own quarterly survey of businesses, the biggest independent survey in the UK, is concrete evidence of this - with the worst figures across the board in nearly a decade," he added. Independent coffee chain Boston Tea Party said sales have fallen by £250,000 since it banned single use cups last summer. But it has called for major national and international brands to follow suit. Ryanair's pilots based in Portugal have voted for a collective labour agreement governing pay and conditions for the next four years. The agreement was negotiated between Ryanair and the Portuguese pilot union SPAC to cover all of the airline's directly employed pilots in Portugal. Let's catch up with the latest on Wall Street now. Shares in chemists chain Walgreens Boots slumped on Tuesday after the chemist chain cut its 2019 profit growth forecast and reported a lower than expected quarterly profits. The 12% fall in the company's shares has helped to drag the Dow Jones index lower. The declines in pharmaceuticals stocks combined with lacklustre economic data to weigh on US shares. New orders for key US-made capital goods dipped in February while shipments remained. Half way through the trading day, the Dow Jones was at 26,172.22, a fall of 86.20 points or 0.33%. The S&P 500 was at 2,865.71, down 1.48 points or 0.052%. However, the Nasdaq was up slightly at 7,843.70, a gain of 14.79 points or 0.19%. In another twist to the Superdry story, which earlier saw eight directors resign, it's emerged that UBS and Investec also resigned as Superdry financial advisers on Tuesday. The Gambling Commission said it might also investigate "key senior staff" at bookmakers who were responsible for launching the games which were pulled earlier on Tuesday. The Commission’s chief executive Neil McArthur wrote to bookmakers to warn the industry against "any attempts to circumvent the FOBT stake cut and remind them of their responsibilities to ensure their consumers are protected". Richard Watson, executive director for enforcement, said “We have been absolutely clear with operators about our expectations to act responsibly following the stake cut implementation this week. Back to the news that Paddy Power Betfair and BetFred have dropped new games which they launched in response to the cut in the maximum stakes playable on fixed-odds betting terminals (see earlier posts). The regulator, the Gambling Commission, said the products were pulled following a warning it issued to the bookmakers. The firms could still face "regulatory action as the Commission continues to investigate". It added that a third bookmaker which had been poised to launch a new product had also been "warned". "This week saw the introduction of reduced maximum stakes on FOBTs from £100 to £2 and the Commission is concerned that the new products undermine the changes made," it said. 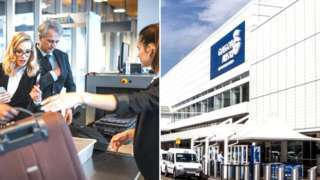 About 500 staff at the terminal will strike on 16 April but the airport insists there will be no disruption to services. In London, the FTSE 100 closed up by a shade over 1% or 73.74 points at 7,391.12, amid a fall in the pound against both the dollar and the euro. 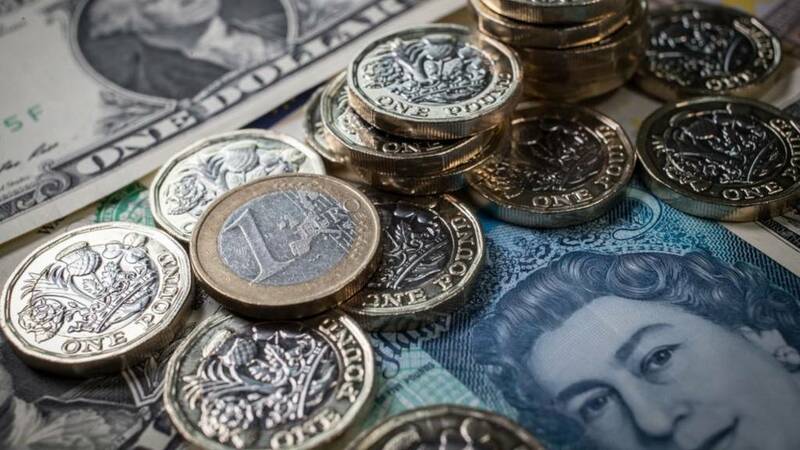 The fall in the pound boosted the FTSE 100, as a weaker currency raises the value of companies' overseas earnings when they are brought back to the UK and converted back into pounds. "Tuesday's clear winner, the FTSE climbed more than 1%, spring-boarding off of the bent back of a Brexit-weary pound to hit 7,400 for the first time in six months," said Connor Campbell, financial analyst at SpreadEx..
"All its major sectors were in the green, including a tidy little showing from the banking stock." Hargreaves Lansdown and Standard Chartered were among the biggest climbers, 4.1% and 3.43% respectively. Royal Dutch Shell has reviewed its lobbying operations and decided to leave one key US lobby group because of a disagreement over climate policies. Shell will quit the American Fuel & Petrochemical Manufacturers in 2020. The firm wants to show investors it's joining the dots over commitments to meet climate change goals. Shell said it also disagreed with AFPM’s opposition to putting a price on carbon and taking action on low-carbon technologies. Following Superdry founder Julian Dunkerton's re-election to the board, the fashion chain says chairman Peter Bamford, chief executive Euan Sutherland, chief financial officer Ed Barker and chairman of the remuneration committee Penny Hughes have resigned with immediate effect. In addition, Dennis Millard, Minnow Powell, Sarah Wood and John Smith have given three-months' notice and will stand down as directors on 1 July. Founder Julian Dunkerton has been appointed interim chief executive. Peter Williams - chairman of online retailer Boohoo - has been appointed chairman. Mr Williams and Mr Dunkerton said: "We are very pleased to be joining the Board of this great British company. We look forward to rebuilding the Superdry brand and the business."